Throughout the year, we offer a wide range of events to help film makers get their hands on the latest technology, learn a new skill and get ahead of the competition. Our events include new product launches, training workshops, Masterclasses from top DoP’s and interactive webinars. All of these events have a practical bias, emphasising hands on learning from experts within the industry. Whether you are a complete novice or seasoned professional, we have events to suit all levels of skill and experience. Come along and get your hands on the new products from Litepanels and Anton/Bauer launched at NAB ! Professional photographer and filmmaker David Newton will put these new products through their paces during this interactive Masterclass on lighting. You’ll learn how to work with the best LED lighting technology available to craft, sculpt and shape light. In this afternoon session, using practical examples and live product demonstrations David will take you through lighting a simple set for great results. These sessions are heavy on your involvement. Don’t expect to simply sit in a chair and be talked to. You’ll get involved in the lighting setups we create and have the opportunity to try-out the new products for yourself. Plus the 1x1 Astra panels and Gemini 2x1 RGBWW soft light. 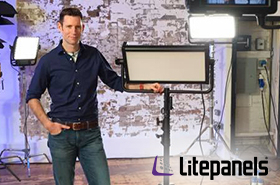 Come along and get your hands on the new products from Litepanels, and Anton/Bauer launched at NAB ! In this morning session we’ll look at multi-person interviews - how to avoid cross lighting, how to add an extra dimension and how to bring some visual impact with lights. You’ll have the opportunity to get involved in the lighting setups we create and try-out the new products for yourself. "Visual impact is the best"